The detection error of the instrument refers to the error between indication and the set value. The alarm point of the instrument is set at 24µmol/mol, and the 28µmol/mol standard gas is injected into the instrument to read the alarm level. Repeat this step for three times and take the average of the reading of the three times as the alarm level of the instrument. Calculate the instrument's alarm error, and judge whether the detector is qualified. First, use the calibration device for calibration. Usethe ozone detector designed based on the ultraviolet light method to choose tentest points on the ozone detector for comparison. Control the error scopewithin ±1% to be qualified.Second, use the chemical titration for calibration. Theinternationally-acknowledged chemical method, namely potassium iodide andsodium thiosulfate titration for detection of the ozone concentration. We willalso select ten test points, and compare them with ten points tested by thechemical titration using the ozone detector. Precision is an important performance index of the gas detector and an important factor influencing precision of measurement results of the gas detector. According to national standards, precision of the gas detector should be ±3% of the full range. The gas detector with a higher precision can achieve ±1% of the full range. The higher the precision is, the better the performance of the gas detector is. 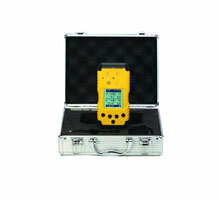 The service life of the gas detector is mainly decidedby its main component, gas sensor. As we know, there is not a sensor which candetect all kinds of gases and satisfy all kinds of requirements. The sensor todetect different gases and for different environments is different, which canbe generally divided into the sensor to detect the toxic gas concentration andthe sensor to detect the flammable gas explosion concentration. The sensor used to measure theconcentration of toxic gases is mostly an electrochemical sensor. As a sensormade based on the electrochemical principle, it is mainly influenced byelectrolyte in terms of its service life. Under an ideal environment, theelectrolyte will be consumed to a level that most sensors cannot work normally.Therefore, the service life of electrochemical sensors is two to three years.